The filters on the "Record Progress (Bulk)" page now work properly. Users can now edit and delete their own vehicles. Users can now load more events on the itinerary section of the dashboard. The "pay" button was disappearing under certain circumstances for events that required payment. This is now fixed. When you create a meeting schedule you can now invite everyone. The calendar wasn't showing multi-day events that started in the prior month, but it does now! Emails with copyright symbols were crashing. No more! You can copyright the heck out of your emails now! We replaced "User Guide" links with "TroopTrack User Community"
When you click on the "Get Help" link, it was forcing you to search even if you wanted to report a bug or suggest a feature. You don't have to search anymore to see those buttons. 1) When you print the agenda view of your calendar, you can now choose between landscape and portrait orientation. 2) We released an internal tool that will allow Melissa to fix the AHG badges that don't calculate percent complete properly. You should start seeing fixes for those badges appear over the next few days. 3) There was a bug in our payment setup that wouldn't let you turn off accepting credit cards once you set up PayPal. This is fixed. 6) The agenda view of your calendar now paginates properly. Previously you could not go to any pages other than the first page. 7) The category now saves correctly when you do a bulk transaction (money) that is not a transfer. 8) Table header rows no longer overlap the table content when printed. I am going to post another announcement about our new user forum,http://community.trooptrack.com, later this morning, so stay tuned. Later this week we are going to officially launch http://community.trooptrack.com, our new forum for TroopTrack users. It is already available for you to check out and is integrated with TroopTrack so you can access it with your TroopTrack account. Community will become the official mechanism for suggesting new features and reporting bugs - we will no longer use the help desk for that. Help desk tickets will be reserved for specific problems that require sharing personally identifiable information or are otherwise not solvable via Community. Additionally, the way you submit help desk tickets will change. Prior to submitting a help desk ticket you will be prompted to search Community for help with your problem. We hope these changes will help you get answers more quickly and allow us to focus our customer service efforts where they are needed most. Please share this announcement with your leaders so they will not be surprised when we launch these changes in the next week or so. 1) Money transactions were crashing in certain cases where the user had been deleted. 2) Account setup instruction emails were crashing in some cases. This is fixed. 3) The OA report (BSA) has been improved to include CSV export and more information about each member. 4) The equipment check-in button was misbehaving if you clicked it rapidly (i.e. double clicked). 6) The rank progress report (BSA) was not dealing with the new & old rank requirements properly. 7) Recording attendance wasn't working properly when you used filters to hide some groups and then used the "check all" checkbox. Thanks to Spencer for all these bug fixes! This morning we released a bug fix that was not showing the "Deposit Funds" link on many money accounts when it should have. Sorry for the inconvenience! 1) The dashboard was displaying service hours in the camping nights field. This typo has been fixed. 2) We briefly broke user profiles for Boy Scout troops. If you encountered a problem late last night or early this morning, it's been fixed. 3) The custom leadership report now shows columns in a more logical order and the column "Name" is now displayed as "Position" to avoid confusion with the leader's name. 4) The vehicle listing now includes license plates. 5) AHG service stars were not appearing on the Unit listing after they were added with the new service stars feature. This has been fixed. 6) Links in event descriptions were no longer clickable for a brief period. Fixed! 7) The "all categories" link on troop documents was not working. 8) We have removed the ability to delete sub-awards (i.e. cub scout electives that are grouped with a rank) since removing them breaks the structure of the rank record. You're probably wondering where I'm at with the event payment improvements. The truth is, I'm a bit stuck mentally and need a brain wave. Hopefully I will get unstuck quickly and be able to give a more cheery update soon. This morning we are releasing a number of minor changes. 1) The API for event details now includes a section for information about family members. This is in preparation for an update to the iOS app to allow RSVP'ing for family members, but it could also be used by anyone in the developer program as well. 2) Service hours are now displayed as "X hrs Y min' on manage service stars page (AHG only) instead of using a decimal format. 3) Troop documents are now arranged like one of our interactive "books" with a filter for categories. No more scrolling through all categories! This feature isn't quite ready for Trail Life Troops yet (sorry!). 4) The "show other events" setting on newsletters was confusing, so we've clarified that it means "Include events the recipients are not invited to". 5) One of our users discovered that Meeting Schedules crash if you have more than 260 monthly events, so we've limited it to 250, which should be enough for even the most ambitiously planned calendar! 6) Sending achievement reports by email was failing if the no users with emails were selected. We've fixed this problem and added some feedback to let you know if a problem occurred. 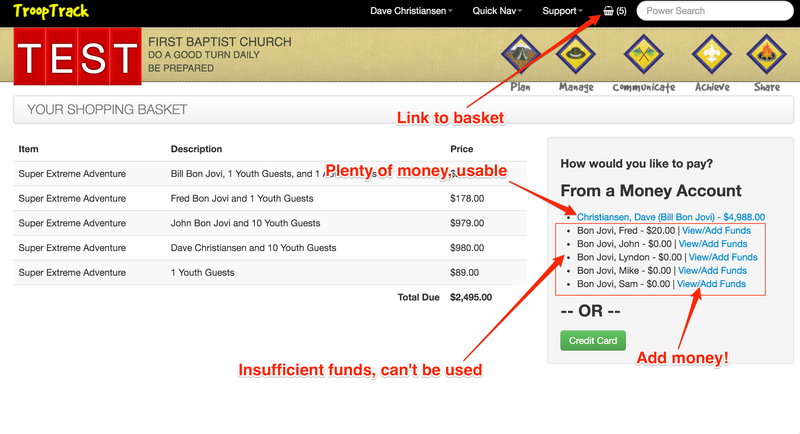 Making progress on the event payment improvements I mentioned previously. Here is a screenshot of where I am currently at. You can see that money accounts with insufficient funds are not usable for payment and that I can add money to those accounts or use a credit card instead. You can also see the link to the shopping basket. I've also included a screenshot of the event details page so you can see changes there too. I hope I can get this done and live soon - I will keep you posted. 1) We updated our page about the ScoutBook acquisition to be less snarky and more current. One of the issues with being committed to openness about our product is that customers are occasionally exposed to how we feel when tough challenges occur. I think that's okay, but we need to update stuff as we get distance and perspective from those events. 2) We've added support for BSA Service Stars for Troops. 3) AHG Service Stars now appear properly in the Advancement Overview. 4) We are more consistent in how user names are displayed throughout the application. We are very committed to being open at TroopTrack about what we are working on, what we are struggling with, etc. While this is generally a good thing, it gets us in trouble with users sometimes who feel we should be working on something else. I've been thinking about this a lot today because of some recent exchanges we've had on Facebook and I'd like to explain a bit about how TroopTrack works. First of all, we don't all work on everything, nor can we. We divide things up, and some of the work we do requires experience and education. Here's how TroopTrack work is divided up. - Marc works on our mobile applications (iOS and Android). He's the only one with this particular skill. - Ryan, Spencer, and I work on the web application. Ryan and I also do consulting work for our enterprise clients such as Trail Life USA and American Heritage Girls. - Claire, Sam, Wesley, and Coleman are primarily responsible for answering your questions and identifying any important bugs that you report. - Melissa is primarily responsible for configuring TroopTrack to support specific programs. She adds achievement, training, etc and works with customers who have asked us to add support for their organization to get everything set up. I want to clarify this because it's pretty common for us to announce something I am working on and have someone say something like "You should be working on the Android app instead," as if me adding some new feature to our web product is somehow preventing Marc from moving forward with our Android app. This is simply not the case. I can't really help with the Android app, and Marc can't really help with the web app. Heart surgeons don't generally do kidney transplants and vice versa, even though they are surgeons. Programmers are no different. Likewise, when we add support for a new organization, like Search and Rescue Groups, there is virtually no programming involved. Melissa does almost everything to set them up. She can't write code, so her doing this work doesn't prevent Ryan, Spencer, and I from adding new features and fixing bugs. We don't stop working on our backlog of bug fixes and feature requests just because Melissa is adding a new group. I share all of this in the spirit of openness and friendliness. I hope nothing I have written will be perceived as haughty or uncaring. We love TroopTrack and we try very hard to make it better every single day. We don't always succeed, and sometimes we make it better in ways that only benefit some of our customers, but we keep at it, and we hope it shows. Well... yesterday's release of categories for money transactions was a bit of a comedy of errors. Except it wasn't funny. We think we've got everything squared up now. Here is the list of things we fixed this morning (items with an asterisk were introduced as part of yesterday's release). 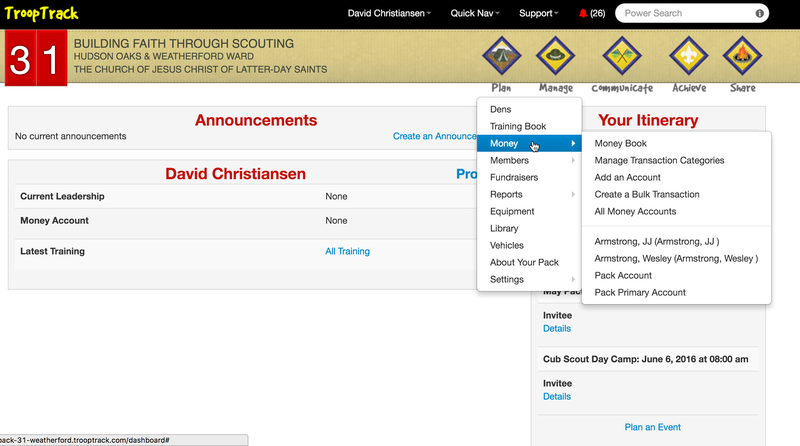 4) The new "money" menu is now available to BSA and TLUSA troops. 5) We fixed a really confusing bug with the AHG Connect importer. If a girl had two or more level awards in AHG Connect that were not complete, the importer was replacing the requirements of the last incomplete award with the requirements of the first incomplete award. For example, let's say Susie has not completed the Fanny Crosby and Sacagawea awards and you imported from AHG Connect. Susie's record wouldn't show the Fanny Crosby award at all and her Sacagawea award would show the Fanny Crosby requirements. This is fixed. I'm very relieved to have figured out #5. It's been vexing me for a while and was a source of significant frustration for our AHG troops. If you find you have a girl with one of these mixed up achievements, you can just delete it from her profile and then either import again or just add it directly. 1) Better control of money accounts on the manage menu. See the picture. Due to a slight error on my part, this won't be there for BSA Troops until tomorrow. Sorry! 2) Direct control of categories for money transactions. You can create categories you want to use, then select one or more for each transaction. We replaced the autocomplete category feature because we were getting lots of complaints about duplicate categories with slightly different wording, like "Camp Fees", "Summer Camp Fees", etc. 3) The "All payments" page for events was really only working for events that accepted payment from money accounts, not Stripe (credit cards) or PayPal. It now works for these payment methods as well. 4) We've added icons for switching between the calendar and agenda views to make it easier to go back and forth. 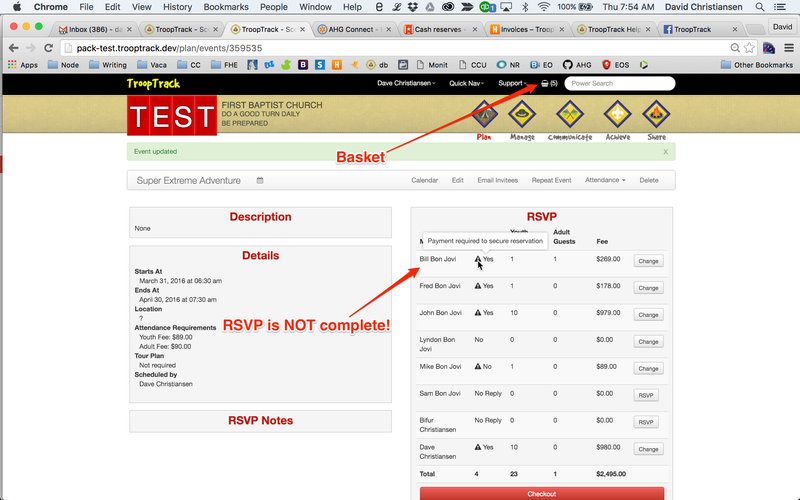 The links retain the other settings you've made, such as to show only the events you are invited to, etc. 5) All-day events are now displayed the same way we currently display holidays (at the top of the calendar box for the day on which they occur). 1) The "quick switcher" link on user profiles was great for switching between the achievement tabs of users, but not so great if you were working on the money tab or other tabs. One of our users in Australia pointed this out and we have updated the quick switcher to switch to the same tab you are currently on of the user you select. 2) We've been having problems calculating the percent complete value for certain awards, particularly in cub scouts. We have fixed the problem and the next time you make any changes to awards the percent complete will calculate properly. If you don't want to wait for that, just open a help desk ticket and ask us to recalculate percent complete for your entire pack/troop/group. 3) For AHG troops we were showing Explorer badges on the Pioneer tab for certain girls. We have fixed that. That's it! I'm off to Orlando tomorrow morning for a week. We will have reduced help desk availability during this time as it is spring break for half of our staff and we all want to take vacations.